Ivy can be a wonderful aesthetic addition to trees or buildings, however it must be maintained correctly to stop it from damaging plants, walls and structures. If left to grow naturally for a long period of time, it can result in weakened brickwork, blocked guttering or the suffocation of other plants, leading to more costly repair work further down the line. If you’re looking for ivy removal in South London then South London Tree Surgeons can help. Our experienced team of qualified arborists can tackle any ivy removal project, no matter how big or small. We’ve helped hundreds of residential and commercial customers in Croydon, Balham, Crystal Palace, Norwood, Clapham and throughout South London. Why Is Ivy A Problem? Removing these invasive plants can be dangerous without the right tools and training. It’s always advisable to use a professional arborist, particularly if the ivy has reached a significant height up the tree, building, wall or fence. Why Use South London Tree Surgeons For Ivy Removal? At South London Tree Surgeons, we’ll help to advise you on the best course of action for your ivy or other climbing plants. We can provide full ivy removal South London or simply prune it back to maintain a more traditional appearance. We’ll always ensure that your property is left in the same condition or better, and will responsibly dispose of all waste created from the project as part of our service. At South London Tree Surgeons, all of our arborists are NPTC qualified, giving you the peace of mind that you’ll be working with professionals from start to finish. Our staff are all fully insured with £5m of Public Liability Insurance and Employers Insurance. Need a full garden maintenance and tree surgery package? We provided a huge range of other tree surgery services including tree pollarding, tree felling, tree pruning, hedge maintenance, site clearance and more. Check out our services page for more information on the full range available services. 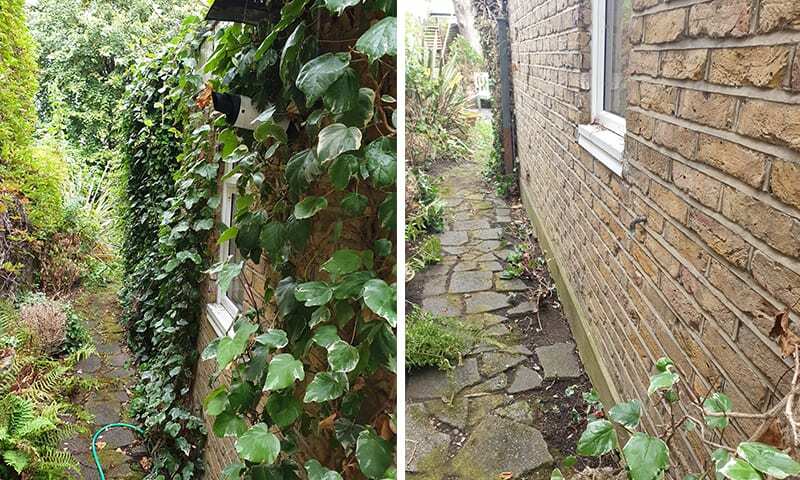 For a free, no obligation quotation on ivy removal in South London, contact us today.